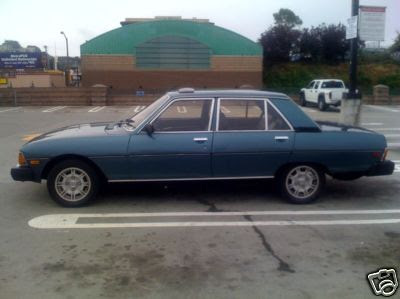 Just A Car Geek: 1982 Peugeot 604 - eBay Find - How Many Can Be Left? 1982 Peugeot 604 - eBay Find - How Many Can Be Left? Throughout most of the seventies Peugeot's main offering in the US was the 504, a quirky sedan that was known mainly for its amazingly comfortable ride. US sales of the 504 had increased steadily throughout the mid seventies and by 1977 sales were at almost 10,000 cars per year, which was more than three times what they had been in the early seventies. Attempting to capitalize on that sales momentum, Peugeot offered a true luxury class car to the US in 1977, the 604. Initially available with just the PRV V6, the 604 was a sales disaster. Honestly, the 604 is not a bad car. I test drove a used one in the mid 1980s. It was unbelievably comfortable and rode like only a Peugeot rides, isolating you from bumps, but still giving you enough feel to make the car enjoyable to drive. The problem was it was nothing special. In the US Peugeot had an almost Saab-like following. Peugeot owners really liked the off beat designs and little quirks. The Pinninfarina designed 604 (Pinninfarina also designed the 504) looked normal, almost bland. The interior was, like the exterior, almost bland. (It's only true quirk, and an annoying one at that, was directional signal lever being mounted on the right side of the steering column. Peugeot eventually moved it to the left, but the fact that they didn't spend the extra few dollars to do that when the car was introduced shows just how little they understood the US market.) Most US Peugeot fans were not impressed by the 604. European luxury / sport sedan fans were even less impressed. At around $12,000, the 604 competed in price with the BMW 5 series, the car that had set the standard for mid-size luxury / sport sedans in the US. It was no contest. To make matters even worse (could it get any worse? ), Peugeot was about to launch the 505 in the US. The 505 was also Pinninfarina styled and managed to look like a Peugeot without looking weird. Depending on which of the many trim levels you chose, it could be as luxurious as a 604 and a lot more fun to drive. Unless you had a need for a big car, the 505 was a better choice. In a last ditch attempt to get some sort of buzz going about the 604, Peugeot introduced the 604 Turbo Diesel in 1982. While the diesel 604 could get 30 MPG, it was slow, noisy and smelled bad. Again, the US car buying public was unimpressed. Even Peugeot eventually recognized this and after the 1984 model year, they pulled the car from the US market. The car being offered on eBay has to be one of the few survivors in the US. (Besides not selling well when new, 604s rusted horribly. How many can be left?) It appears to be in very good condition. (The seller posted a 5 minute video in his listing which gives you a really good idea of the condition of this car.) It would be a great bio-diesel candidate, or just leave it as is and enjoy driving a car that is incredibly comfortable and gets decent MPG. Expect to get a lot of questions about it and don't expect to win any races. Located in San Francisco, click here to see the eBay listing for this car. For more pictures and some information about the 604, check out 604tours.com. It's not the best laid out website in the world, but if you search you can find some interesting stuff. Big french cars, they are an acquired taste. Both Peugeot and Citroën have struggled to produce a large car that you would actually want to own. For comfort, there hard to beat, but handling, reliability, style, etc have always fallen way off the mark. In Europe you can pick up newer XM's and 605's for nothing, there giving them away. Although, to be fair, the newer Citroën C6 (successor to the XM) has caused quite a stir. The people who do buy them are the French, and in a way, I respect both brands for producing a car that there own citizens want. I get the impression they could care care less if the world is interested in there big cars, as long as there own people are buying them, they will keep producing them. Peugeot never understood that you need dealers in the US to sell cars. I once read a Road & Track report on the 505 and wanted to test drive one. The closest dealer was 150 miles away!